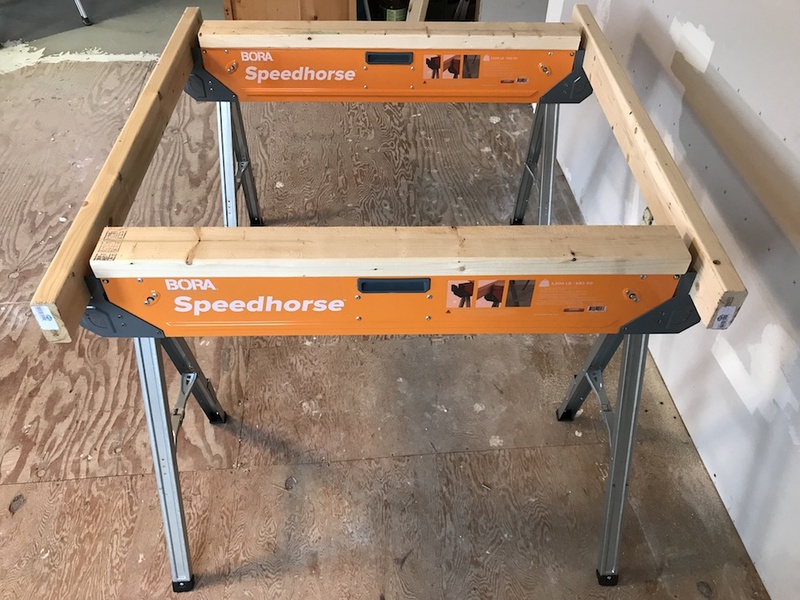 It’s obvious from the moment you liberate the big orange rectangle from its packaging that the Bora PM-4500 Speedhorse is a big step up from the flimsy plastic sawhorses commonly available. Weighing around 18 pounds, it’s a sturdy hunk of steel. The legs tuck neatly inside the top section, making a relatively compact package to store and transport. As I mentioned, the feature set on the Bora PM-4500 Speedhorse is well thought out. The top is covered by a non-slip material. 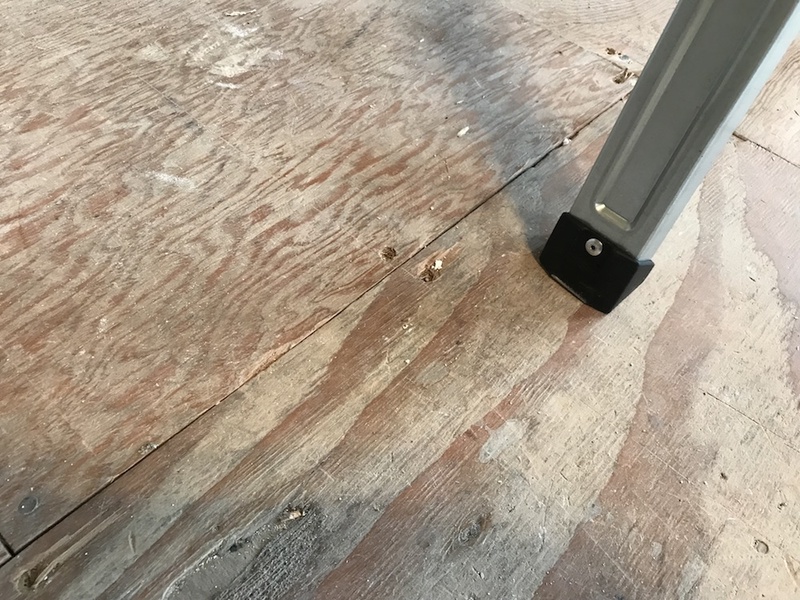 The legs have sturdy steel bracing, and there are protective feet to prevent damage to flooring and reduce slipping. Once it’s set up, it feels very stable and solid. And no-mar rubber feet keep it from making a mess or wandering off. 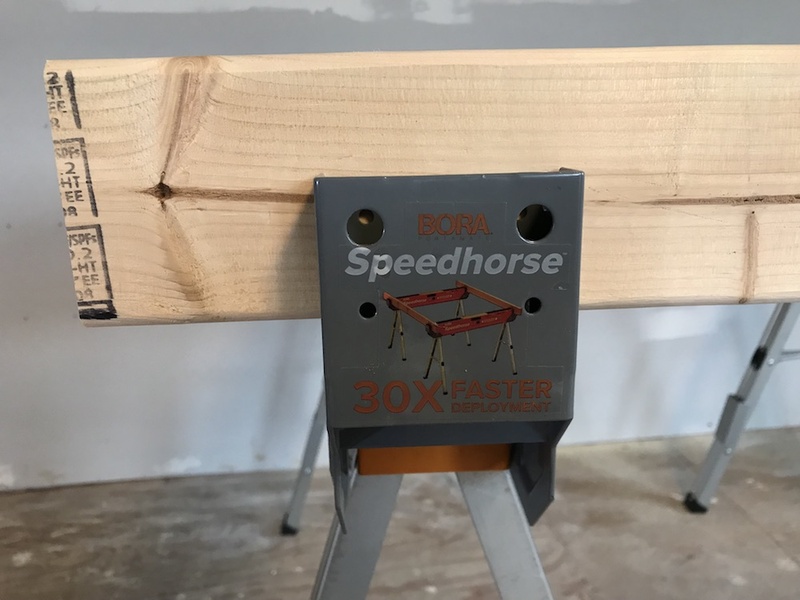 In addition to the pre-drilled holes for a sacrificial top support, each end of the Bora PM-4500 Speedhorse has a slot sized for a piece of 2X material to be inserted on edge. 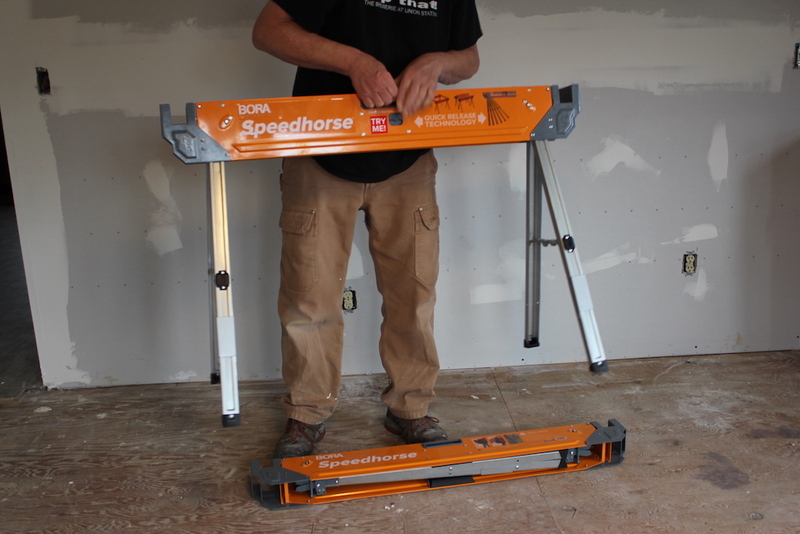 A 2X4 fits perfectly into the slot, with no slipping, allowing you to create a support between two Speedhorses. Holes alongside the slots let you secure crosspieces to the Speedhorse. There are protected holes on the side of the Speedhorse to secure the material to it, creating a solid and stable platform. 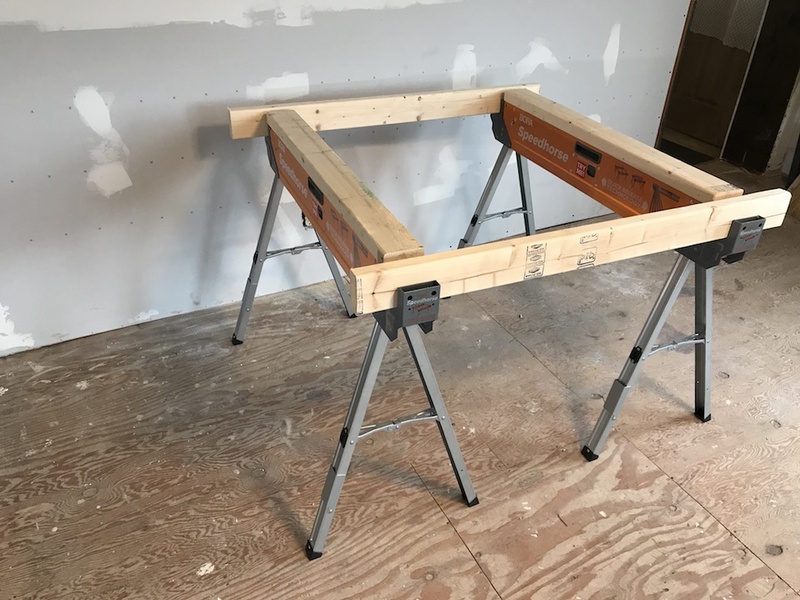 If a 2X4 is used, the top edge lines up perfectly with the sacrificial boards across the top of the Speedhorse, making a perfect 360 degree support base. 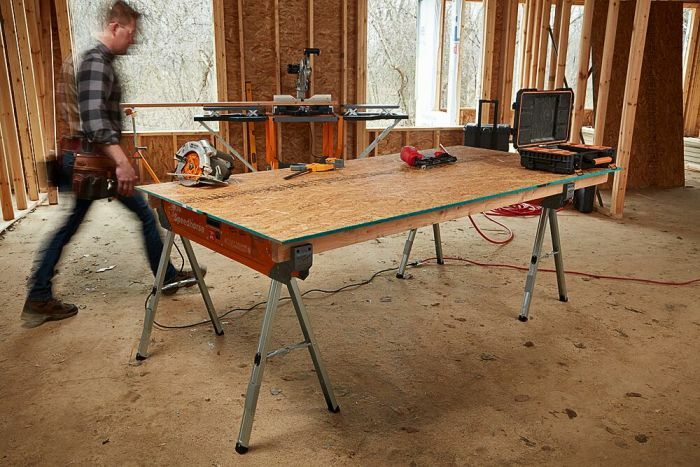 With sacrificial tops and side pieces, you’ve got a solid support base. Now it’s time to talk about the “Speed” in Speedhorse. 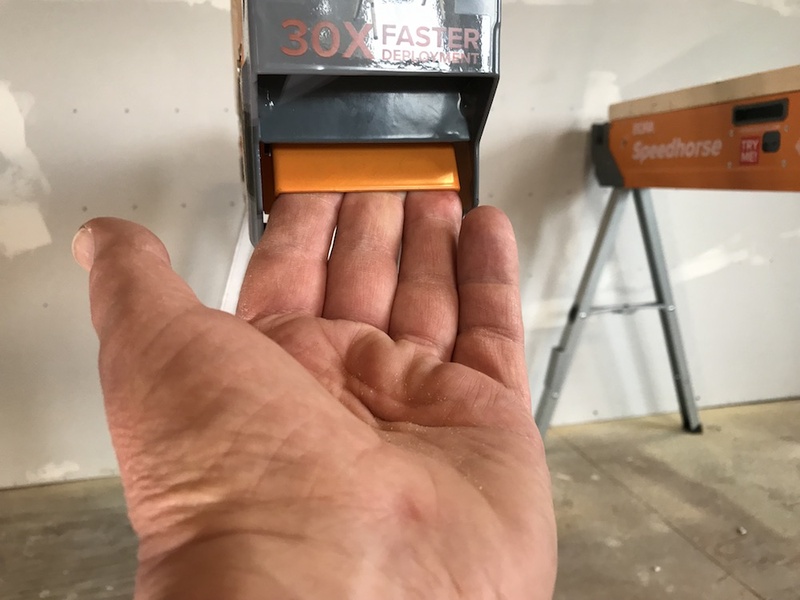 Getting it from that orange rectangle to a usable support literally takes less than two seconds. Just hold it up, push up the release, and the legs drop down and lock into place. 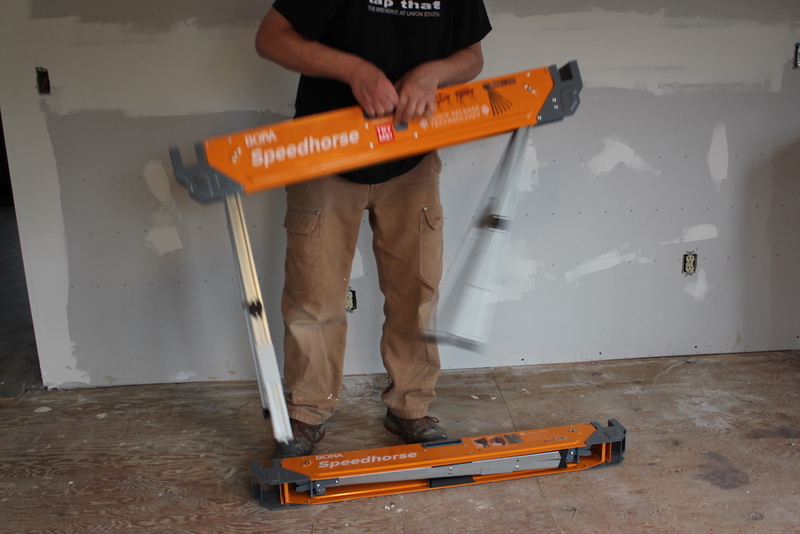 Every time I set up the Bora PM-4500 Speedhorse, the legs locked solidly into position. And the legs drop down immediately and lock into place. Set it down, and it’s on to the next. All done for the day? Takedown is almost as fast. Just lift up the Bora PM-4500 Speedhorse, tilt it a bit, pull the Leg Release flap, and the legs retract toward their storage cavity. You just have to finish tucking them in for the last few inches. Tilt it the other way, repeat, and go treat yourself to a refreshing beverage as a reward. Either set of legs can be retracted first, a nice feature to save you a few extra seconds after a long day of doing whatever it is you do. To collapse it, just pull up on the Leg Release lever on each side, and swing the legs in. 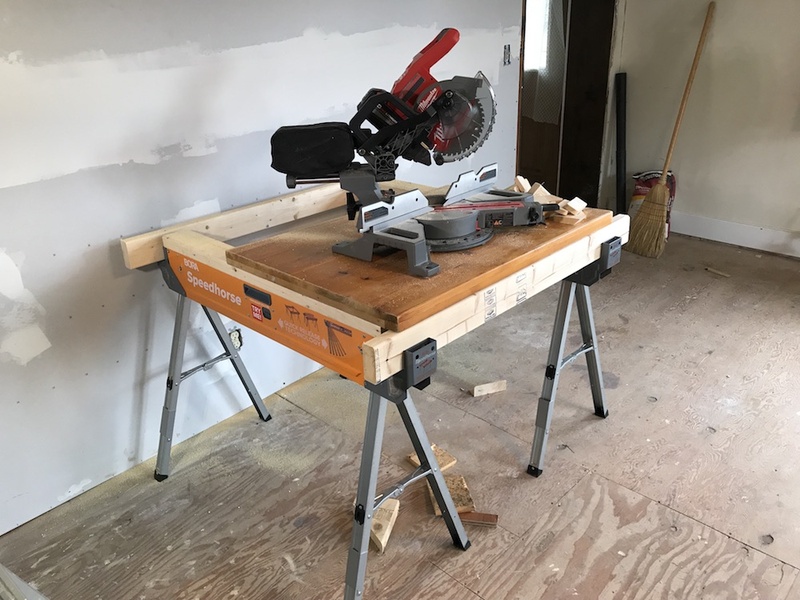 Given my prior history of inadvertently destroying things with sharp blades, I decided to install the sacrificial tops on each Bora PM-4500 Speedhorse before letting my saws anywhere near them. 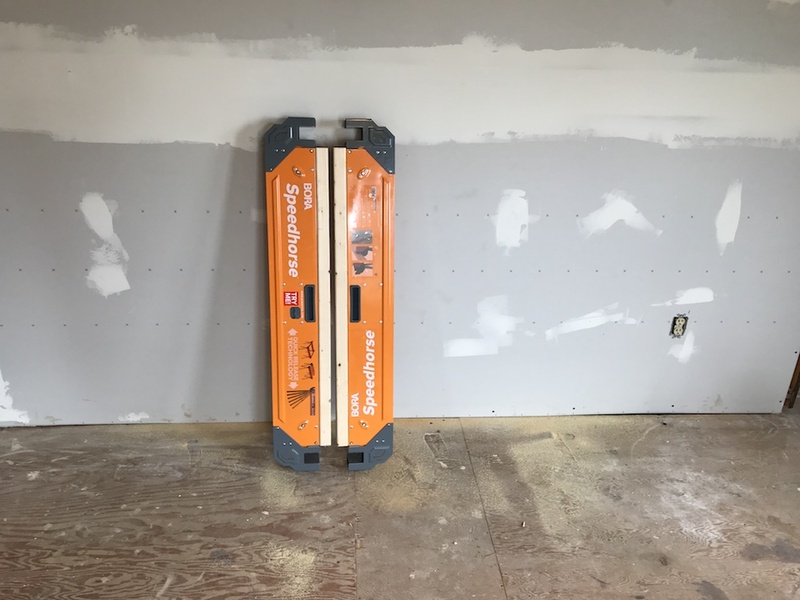 The pre-drilled holes made it easy, and a long bit extension made it even easier. I also cut a couple of short stringers, to give myself a four-sided base. Pre-drilled holes and a bit extension make it easy to add a sacrificial top. Using 2X4s all around keeps everything in the same plane. 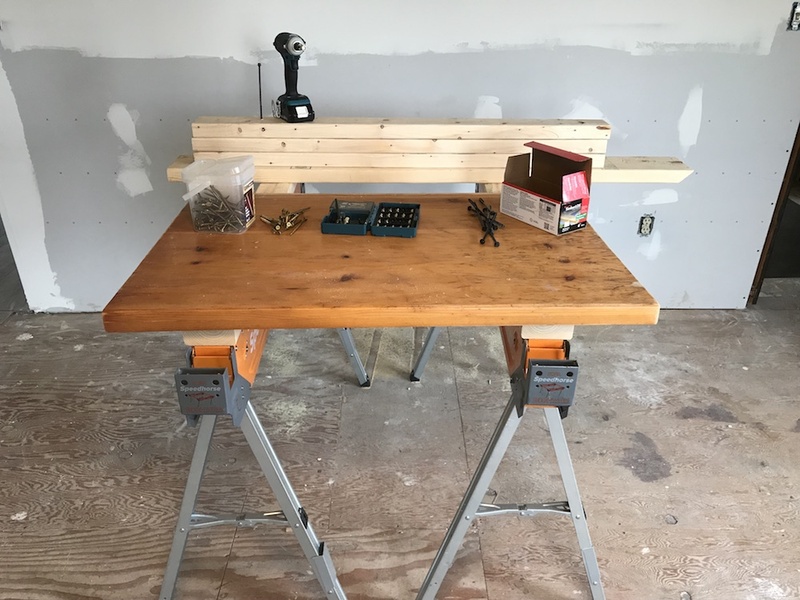 I used a scrap piece of wooden countertop as a work platform, screwing it down to the tops for extra stability. 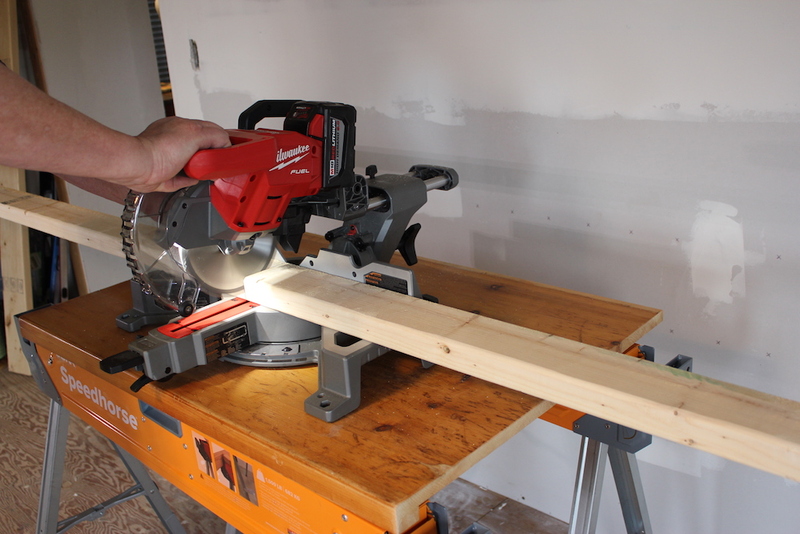 I first used it as a base for my compact Milwaukee compound miter saw (full review coming soon). The Speedhorses provided a rock-solid platform to work from, which is what I want when I have a rapidly spinning, sliding blade close by. I also used it as a base for running several lag screws through some dimensional lumber. Once again, everything stayed firmly where it belonged. The working height of around 33” was very comfortable. Once I was finished, I unscrewed the platform, and had the two Speedhorses collapsed and up against the wall in just a few seconds. 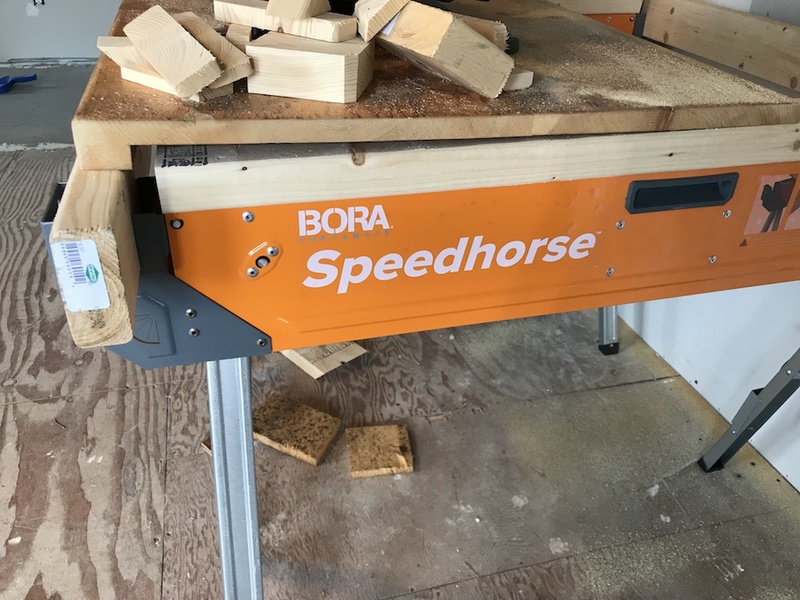 I was impressed by the Bora PM-4500 Speedhorse. It’s sturdy and well-made, has great capacity, and includes plenty of features to make it more useful. 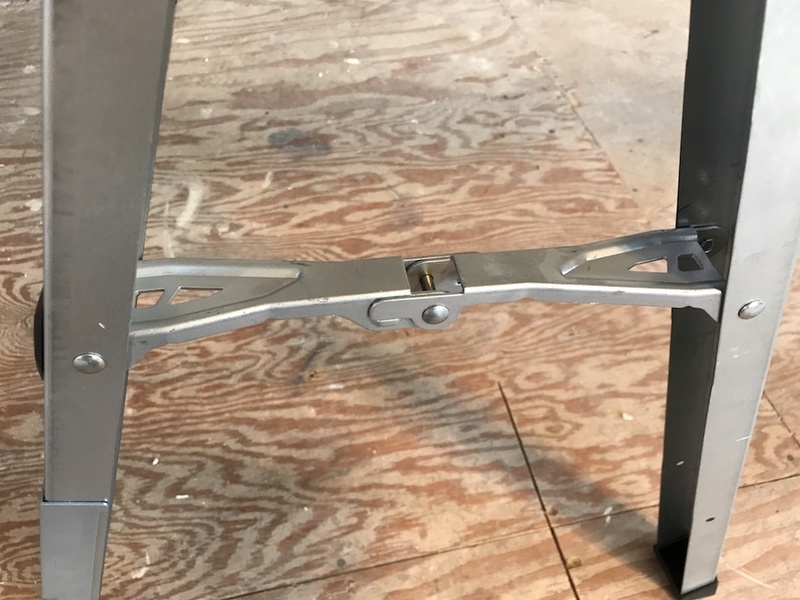 The only addition I can think of to make it more user-friendly would be to make one of the legs adjustable, to make it usable on uneven surfaces. 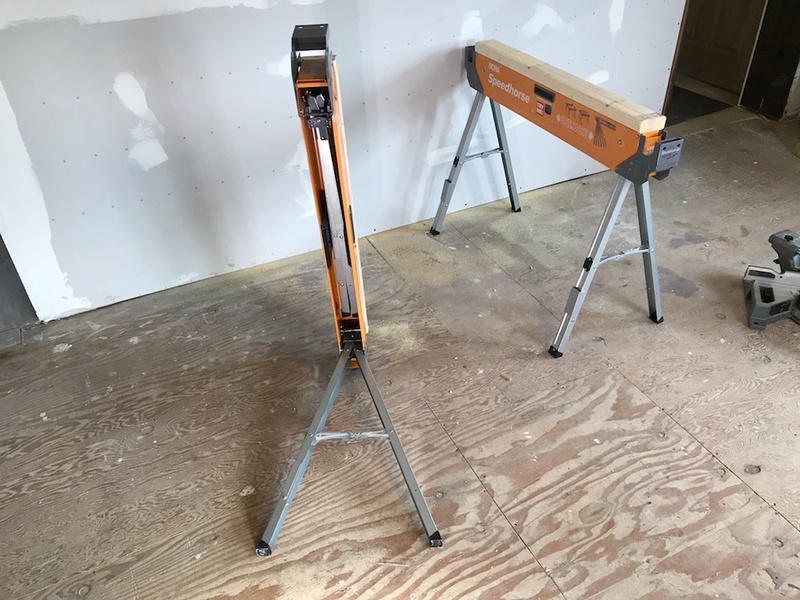 It’s a nice addition to Bora Tool’s lineup of other support items, including sawhorses, miter saw stands, and the unique Centipede Sawhorses we looked at a couple of years back. 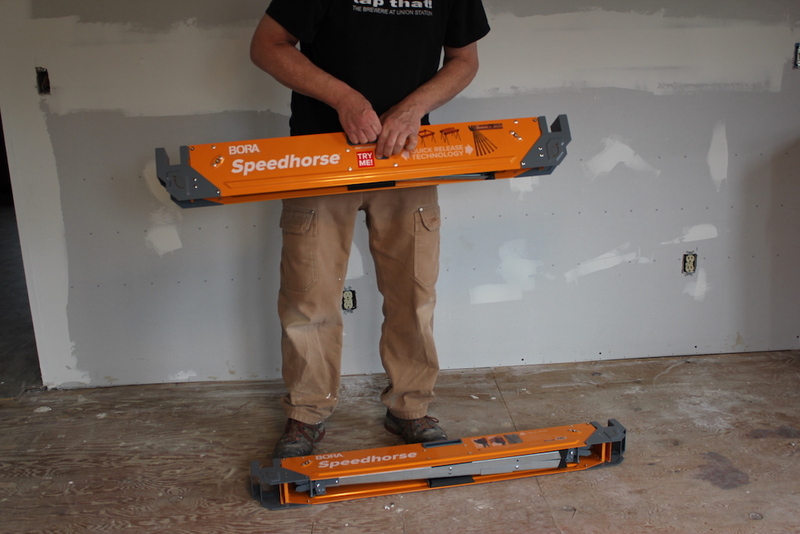 If you’re in need of some support – say, 1,500 pounds worth – check out the Bora PM-4500 Speedhorse. It’ll be there when you need it, and you can fold it up fast and stow it when you don’t. 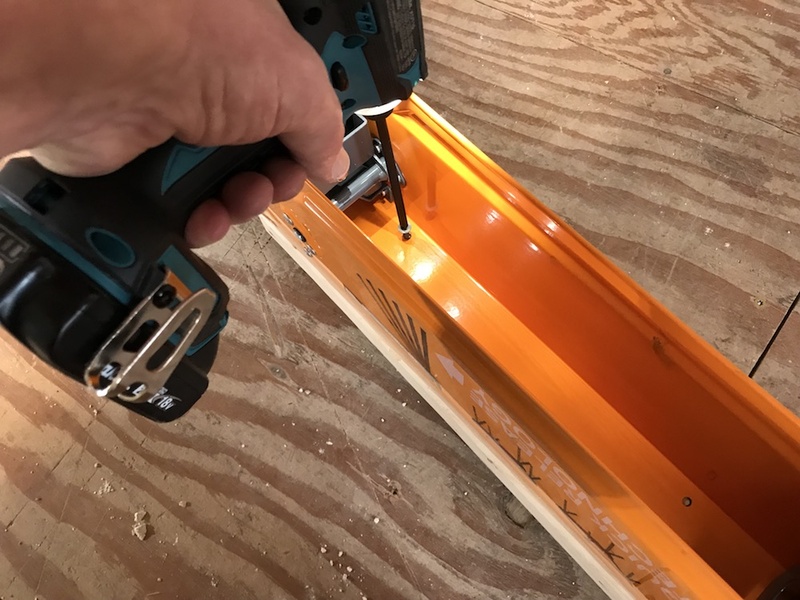 Backed by a one-year warranty, the Bora PM-4500 Speedhorse is available directly from Bora Tools, and at select local retailers. Or check for a retail location with their online store finder.